Easy to use - A fully functional location picker can be integrated to your app within 5 lines of codes. 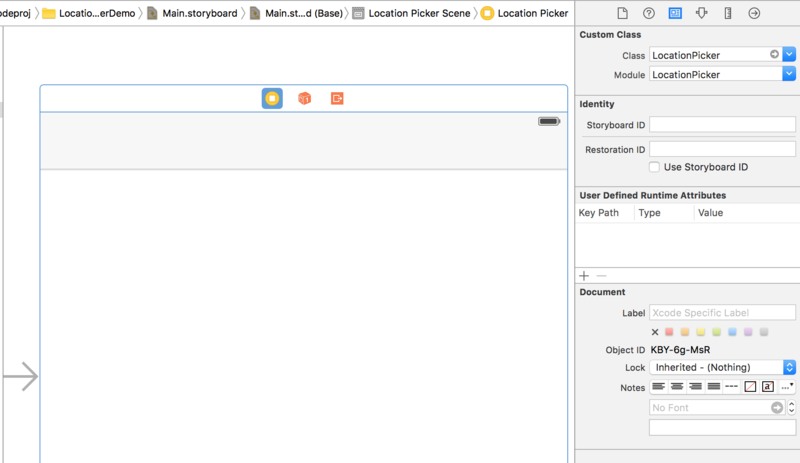 LocationPicker can be subclassed in storyboard or programmatically. Comprehensive - LocationPicker provides Closure, Delegate and Data Source, Override for callback to suit your need. All kinds of locations to pick - Users can pick locations from their current location, search results or a list of locations provided by your app. Fully customizable - LocationPicker provides a great deal of customizability allowing all text to be customized along with the colors and icons. Original UI elements like UISearchBar, UITableView, MKMapItem are also accessible if you want to do some deep customization. Permission worry free - LocationPicker requests location access for you. Swift Package Manager is a tool for managing the distribution of Swift code. Swift Package Manager is currently only available with the Swift 3 development snapshots. Showing LocationPicker via navigation controller is very simple, just create one, add a completion closure and push it. // Do something with the location the user picked. To present LocationPicker, it needs to be nested inside a navigation controller so that it can be dismissed. // Call this method to add a done and a cancel button to navigation bar. Drag a View Controller to your Storyboard. Create a segue and add a Identifier to it. Add the following codes in the source view controller. That's all you need to have a fully functional location picker in your app. How easy! This method provides 3 optional parameter. doneButtonItem and cancelButtonItem can be set as the customized UIBarButtonItem object. doneButtonOrientation is used to determine how to align these two buttons. If none of the parameters is provided, two system style buttons would be used, and the done button would be put on the right side. After this method is called, these two buttons can be accessed via barButtonItems property. This method aims to set colors more conveniently. themColor will be set to currentLocationIconColor, searchResultLocationIconColor, alternativeLocationIconColor, pinColor. primaryTextColor and secondaryTextColor can also be set by this method. This method provides the text of locationDeniedAlertController simultaneously. Grant button will direct user to the Settings where location access can be changed. Note: If alternativeLocationEditable is set to true, please adopt Location Deletion callback to delete the location from database or memory. Alternative locations can also be provided via Data Source. You don't need to set the locationDeniedAlertController if you are satisfied with the alert controller included in LocationPicker. You can change the text of the default alert controller via func setLocationDeniedAlertControllerTitle. If you want to do something other than presenting an alert controller, you can adopt Permission Denied Handler callback. LocationPicker provides three different types of callbacks, they are Closure, Delegate and Data Source and Override, you can choose whichever you like. In most cases, using closures is the most convenient way. If you are already subclassing LocationPicker, override may be the best choice. This completion closure is used to get user's final decision. It would be executed only once for every LocationPicker object when it is about to be dismissed. This completion closure is used to get user's every location selection. It would be executed every time user chooses a location in the list or drag the map view. // Do something with user's every selection. If alternativeLocations is not empty and alternativeLocationEditable is set to true, this closure will be executed when user delete a location item in the table view. 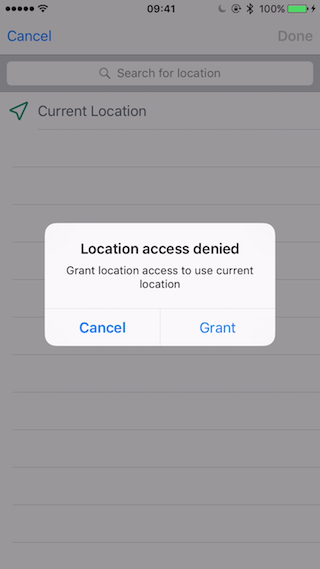 By default, when user request current location but denied the app's location access, LocationPicker will present an alert controller that links to the Settings. You can change the text in the alert controller by calling func setLocationDeniedAlertControllerTitle. If you need to do something other than presenting an alert controller, you can set this closure. // Ask user to grant location access of this app. This delegate method is used to get user's final decision. It would be called only once for every LocationPicker object when it is about to be dismissed. This delegate method is used to get user's every location selection. It would be called every time user chooses a location in the list or drag the map view. This data source method is used to provide locations that show under current location and search result locations. Instead of using delegate, you can also just set the alternativeLocations property. // Get the number of locations you need to add to the location list. // Get the location item for the specific index. If alternativeLocations is not empty and alternativeLocationEditable is set to true, this data source method will be called when user delete a location item in the table view. By default, when user request current location but denied the app's location access, LocationPicker will present an alert controller that links to the Settings. You can change the text in the alert controller by calling func setLocationDeniedAlertControllerTitle. If you need to do something other than presenting an alert controller, you can set this delegate method. If you prefer to subclass LocationPicker, these methods can be overridden to achieve the same result as closure and delegate. This method is used to get user's final decision. It would be called only once for every LocationPicker object when it is about to be dismissed. This method is used to get user's every location selection. It would be called every time user chooses a location in the list or drag the map view. Note: If you override these methods, the corresponding closure and delegate method won't be executed. If alternativeLocations is not empty and alternativeLocationEditable is set to true, this method will be called when user delete a location item in the table view. By default, when user request current location but denied the app's location access, LocationPicker will present an alert controller that links to the Settings. You can change the text in the alert controller by calling func setLocationDeniedAlertControllerTitle. If you need to do something other than presenting an alert controller, you can set this method. LocationItem is a encapsulation class of MKMapItem to save you from importing MapKit everywhere in your project. To make it more convenient to use, it equips with several computing properties to access the MKMapItem. LocationItem is conformed to NSCoding, which means LocationItem object can be encoded to NSData object and decoded back. The hash value of LocationItem is "\(coordinate.latitude), \(coordinate.longitude)".hashValue, so objects that have the same latitude and longitude are equal. If you want to access other properties of MKMapItem object, just call locationItem.mapItem. Since LocationItem is just the encapsulation of MKMapItem, of course you can create a LocationItem with a MKMapItem object. You can also initialize with the coordinate and address dictionary. If you don't want to store LocationItem objects as NSData, you can just store the coordinate and address dictionary, and use this method to initialize. A location can be created with only a name. In this case, the value of property coordinate would be nil. If you encounter any bugs or other problems, please create issues or pull requests. If you want to add more features to LocationPicker, you are more than welcome to create pull requests. If you are good at English, please correct my English. If you like the project, please star it and share with others. If you have used LocationPicker in your App, please tell me by creating an issue.